If It's Hip, It's Here (Archives): How The World Searched in 2012 and A Little Analysis of Google Search Trends For The Past Five Years. 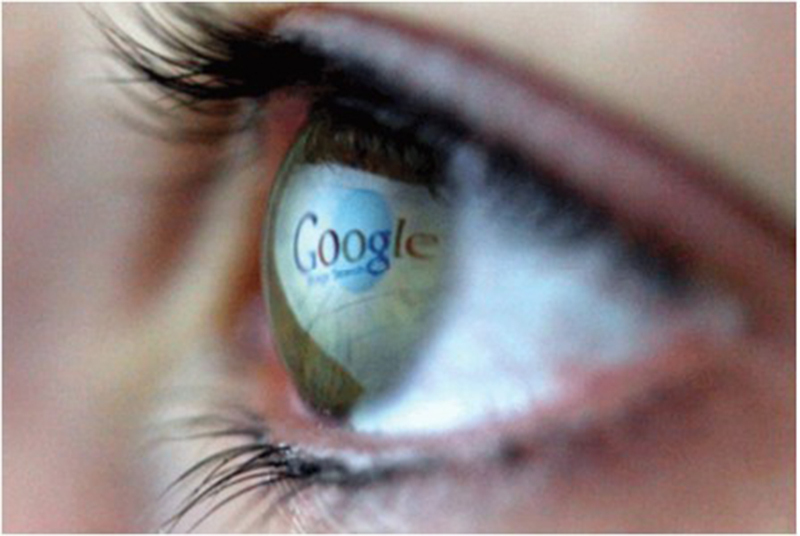 How The World Searched in 2012 and A Little Analysis of Google Search Trends For The Past Five Years. 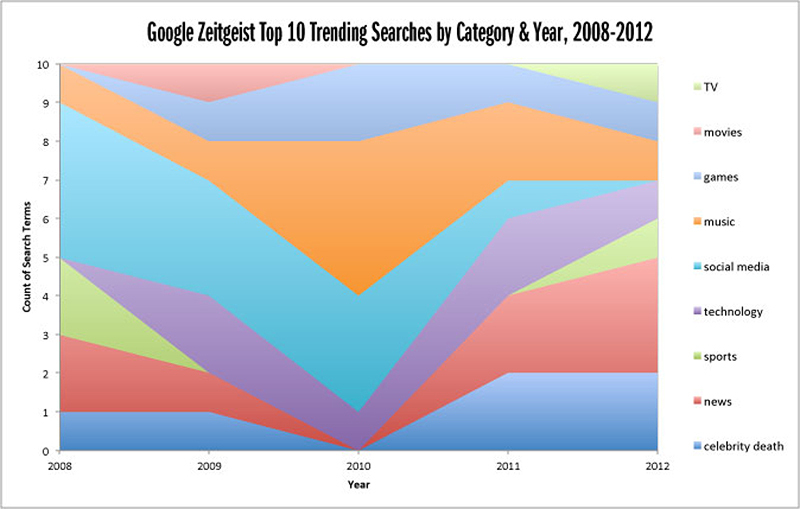 Mark Lee from the blog Overthinking It did a little data analysis of his own regarding the past five years of Google's Zeitgeist (their year-end round up of search trends on Google) that I'd like to share with you. I've reprinted his findings, complete with his hypotheses and commentary below. • These are lists of top trending Google search terms, not highest volume Google search terms. Google defines “trending” as “search queries with the highest amount of traffic over a sustained period in 2012 as compared to 2011.” (Emphasis is his.) Hence the “flash-in-a-pan” nature of the more derided results like Rebecca Black and Chatroulette. • These lists reflect worldwide Google activity. Remember that Google’s share of the web search market is not as dominating in some parts of the world as it is in the United States; China being the most notable example. • He used his own taxonomy based on his intuitive understanding of the different phenomena presented in the results. For example, rather than lump both Whitney Houston and Rebecca Black into the “music” category, he put Whitney Houston and Steve Jobs together in the “celebrity death” category. 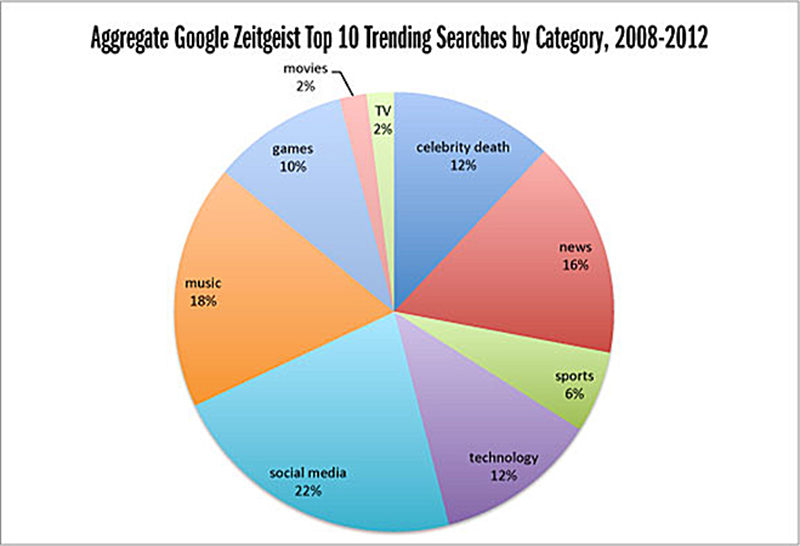 • Although Google Zeitgeist goes back to 2001, Lee only went back 5 years, partly because it’s a nice round number, partly because there was no year-end roundup for 2006, and partly because he wanted to limit the amount that changing search habits and demographics could skew the results. • TV and movies are surprisingly underrepresented. The sole TV entry in the Top 10 over five years is Big Brother Brazil 12, and the sole movie entry is Twilight: New Moon.This is consistent with the idea that our media landscape is more diverse and less mass-market than it was in the pre-internet age. That being said, I’m still surprised that not even Avatar made the list, perhaps due to the year-over-year comparison calculation that powers these results. • Searches for various social media sites has steadily declined since 2008. Is it because people are using social media less? Far from it, if Facebook and Twitter’s statistics are to believed. Instead, it’s probably due to two things: 1) the growth of social media is slowing as Facebook approaches near-total saturation and 2) the growth of social media web searches is slowing as more people access them using smart phone apps instead of a web browser. • Sports cracked the Top 10 only twice, both in Summer Olympics years (the Euro 2008 soccer tournament also made the list). Why less love for the Winter Olympics? It may have something to do with the lack of beach volleyball (and exposed skin in general). Just a wild guess. 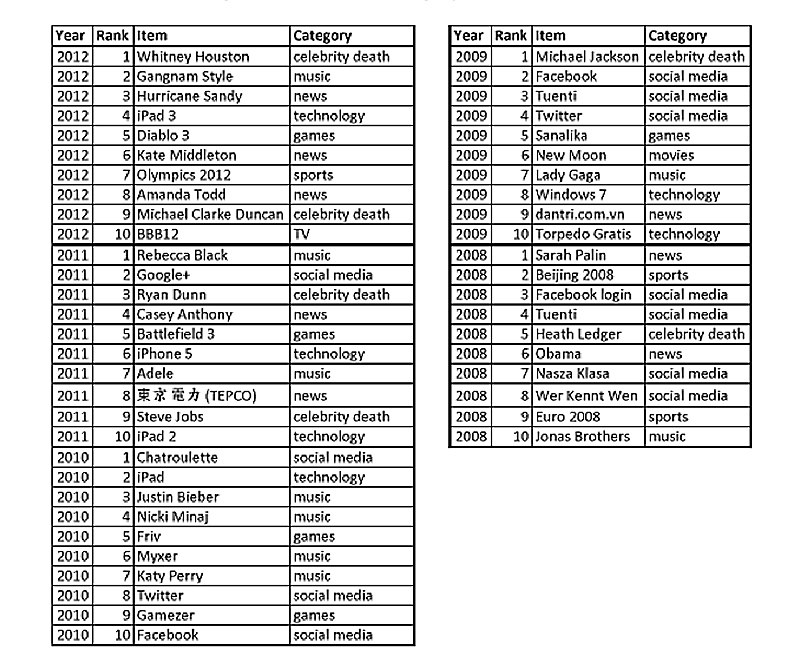 • Celebrity deaths are a reliable source of spikes in Google search activity, but 2010 had no such searches make the top 10 list. He perused several awful slideshows of 2010 celebrity deaths (so you don’t have to), and reports with some confidence that no one of the iconic stature of Steve Jobs, Whitney Houston, or Michael Jackson left us in 2010. Not that iconic stature is the only requirement for making this list; Ryan Dunn of Jackass fame seems to have qualified based on the alignment of the circumstances of his death and his daredevil image. To Lee, the biggest surprise in this exercise was the tailing off of social media searches. As a reminder, it’s not because the total volume is declining; it’s because the year-over-year growth in searches isn’t enough to get these terms into the top 10. Still, if his theories are right–that social media is approaching full saturation and that the usage of it is moving towards mobile devices–then we do have a finding that approaches the idea of a “zeitgeist” in the traditional sense of the term: “the defining spirit or mood of a particular period of history as shown by the ideas and beliefs of the time.” Social media–this potentially radical revolution in how humans interact with each other–not only became a “new normal” over the past five years, but is also undergoing a radical shift from the stationary computer screen to the mobile, always-on-you device. And if this radical reinvention of the radical reinvention isn’t reflective of the zeitgeist, Lee claims he doesn't know what is. Granted, the gap has narrowed recently as searches for “lolcats” has declined while “Google Zeitgeist’ remains more or less consistent, but the point should be clear: the Google Zeitgeist itself is far from a cultural juggernaut compared to the items it contains. It’s not surprising, but it does provide some needed perspective on the matter. Mark Lee is, depending on the day and the hour, a management consultant, a musician, a technologist, and one of the managing editors for Overthinking It. He is a devoted fan of the Terminator movies and Microsoft Excel. Follow him on Twitter: @goestotwelve.